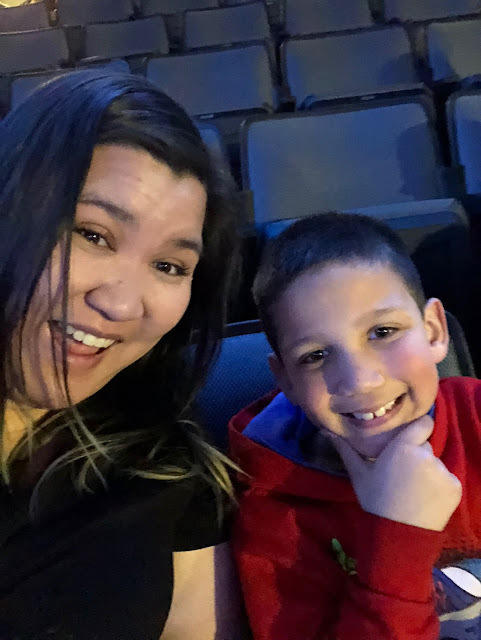 Tonight, we got to go to Disney on Ice at the Golden One Arena in Sacramento. It was our first time going to the Golden One. I was lucky enough to get some press tickets for the show. This was also the kids first time seeing Disney on Ice and riding the Light Rail. I'll start with the show. 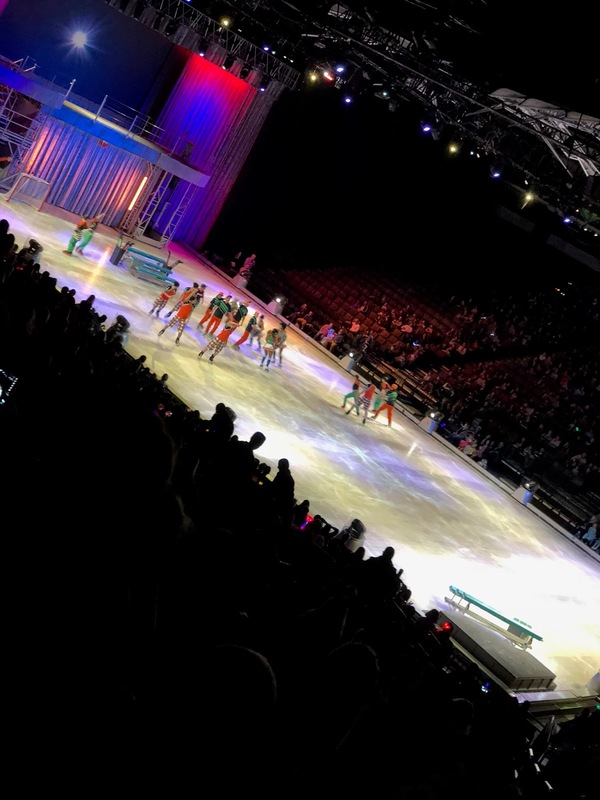 Disney on Ice was more magical than I remember from childhood. How often does that happen? I feel like technology has taken things a long way. For example, they project snow all over the audience during the Frozen scenes. The scenery pieces and skaters who played background pieces were really amazing as well. What took my breath away the most were the aerial stunts done by some of the skaters. I don't remember them doing anything like that when I was a kid. It was crazy to see people flying in the air on just a piece of fabric! I also really liked that they started the show on time. We walked in at 7:04pm which is 4 minutes after it started due to going to the wrong area at first and there were already skaters on the ice. Another really cool thing is that we got to see Inside Out and Finding Dory which made their Disney on Ice premier this show. These numbers were great for keeping the attention of my boys. I also found out that one of the skaters from the Inside Out scenes is a Sacramento native named Justine Wong. I thought that was really awesome! Overall, Avery LOVED the show! She really liked the interactive number and of course seeing Anna and Elsa from Frozen. 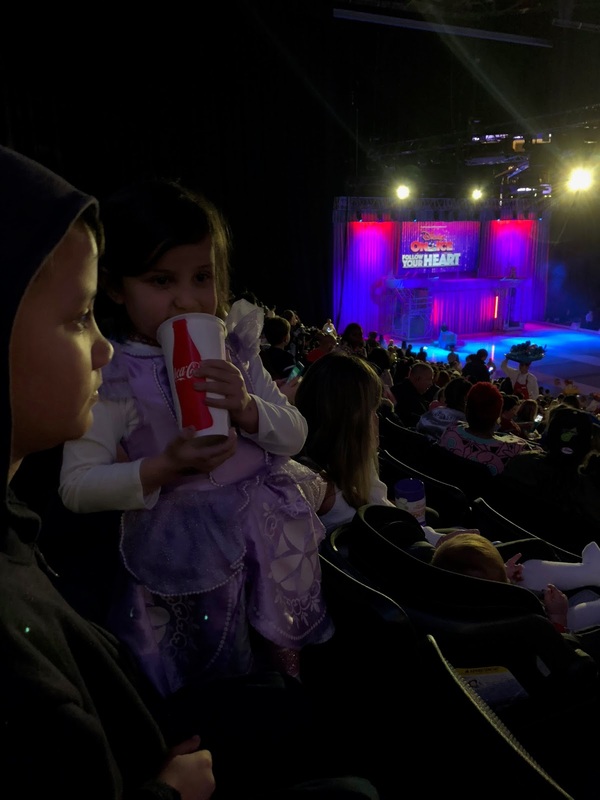 At 5, she is the perfect age for Disney on Ice. My son Parker is 8 and he seemed to really enjoy the show. He would put his hands up when the characters said to do so and he was clapping for the numbers. He did get a little bored during some of the princess numbers but overall, I think he enjoyed about 90% of the show and that's pretty good. My 10 year old son didn't complain at all during the show and he did perfectly fine. He said he liked it. I'm pretty surprised by that. It was a great night out with the whole family which is usually hard for me. There are still tickets available for $20 each. If you go to Raley's or Bel Air, they had coupons to get tickets for $15 each but I'm not sure if they still have them. The Golden One is obviously a lot bigger than the Arco Arena. I don't even know if that's what it's called anymore... but I think you know what I'm talking about. I found the outside layout a little confusing. We needed to go to the box office and struggled to find it. There are so many doors yet so few you could actually enter. It is a beautiful structure and the art around it is lovely. We sat in section 118 row S which is on the main floor without being an up close seat. We were toward the back on the main floor, I imagine it starts with row A. The seats were great. The chairs themselves are comfortable. There are cupholders on the back of the seat in front of you for drinks. I really liked how there were lots of aisles with a railing going down the stairs. It was really easy to get to your seat without trying to step over tons of people. We, including my littlest, could see just fine from our seats. I would come back to the Golden One. 1. I had my Swell bottle confiscated since you're not allowed to have water bottles. I carry it in my purse at all times and did not think to take it out. They would not place it in the lost and found nor let me pay check it. Boo! 2. Tell your kids you will buy them treats a different place or time. Popcorn was $12 for bagged popcorn and a small soda was $5. Ask me how I know. They also have people walking up and down the aisles during intermission trying to sell stuff. 3. Get there early and take a trip to the bathroom. My daughter was SO sad to have to go to the bathroom during the show. She said "I don't want to miss anything!" I felt so bad for her. 4. I also heard you aren't allowed to have weapons and usually they consider pepper spray a weapon so any ladies who are trying to be safe instead of sorry cannot. :( They should really offer lockers outside of venues for this reason. Walking downtown in the dark can be risky. 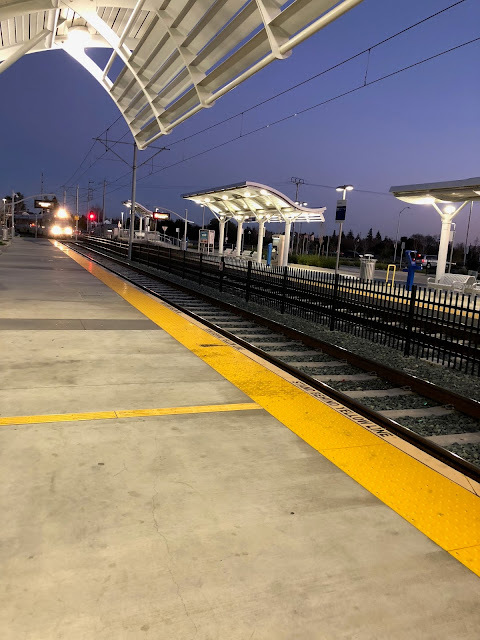 We decided to take the light rail into downtown Sacramento because we thought it would save money on parking and stress on driving in traffic. In retrospect, I would not do this again. First off, you have to give yourself 45 mins to get downtown no matter what time of day it is because the light rail has to make a bunch of stops. Second, it was not cost effective for a family of 5. The tickets were $2.75 each person for a one way ticket. To go to downtown and back, it was $27.50 plus $1 to park our car in the light rail parking lot. I'm pretty sure I could have parked near the Golden One for about that cost. I might have even been able to Lyft or Uber for that price depending on if we were at a surge rate or not. Third, we missed our train twice. The first time, we were trying to figure out how to pay for parking which was not information given in the parking lot. (That's dumb!) We had to wait 15 minutes for the next train since it was 5:45pm and it was during commute hours. We missed our train coming back home too. We were across the street when it pulled up and didn't have time to get there on time. This time, since it was 9:15pm and not commute hours, we had to wait 30 minutes in the cold and dark for the next train. Fourth, on the way, there were a lot of young people on the train talking really loudly to each other using swear words. I'm guessing that's par for the course when school is getting out and commute times. 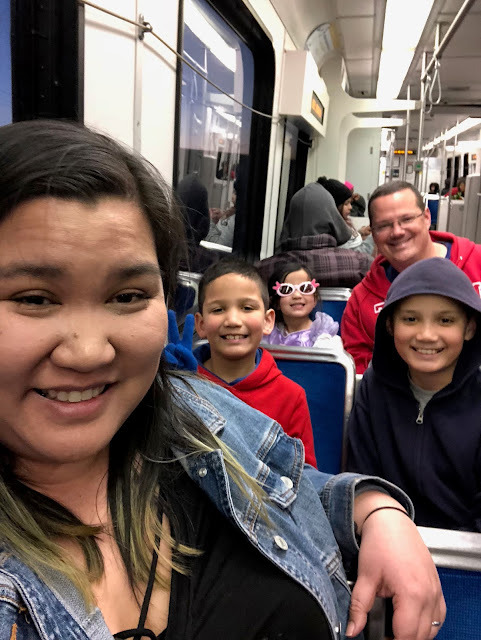 While the kids thought it was kind of cool to ride the train, they did not like the waiting and how long it took to get to our location. With the cost and the extra time we had to add onto our day, I would not do this again. Perhaps you could plan it out better and not miss your train but if one kid needs to go potty, that whole plan is out the window. Hope you found this post helpful! 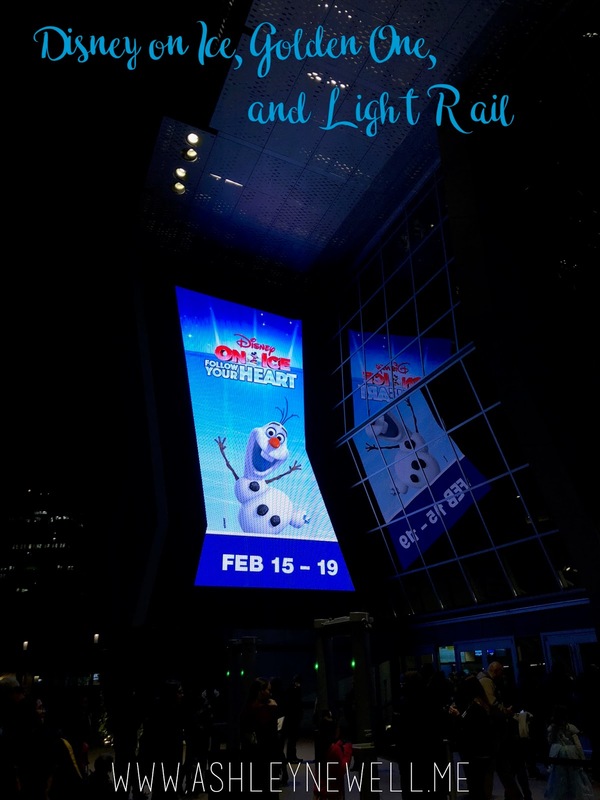 If you have tips for us on Disney on Ice, Golden One, or Light Rail, I'd love to hear them! Overall it sounds like a great experience. I can’t believe the snacks are so expensive. It made me miss the movie theater prices! I didn't know that was a feeling I'd ever feel. It was magical! It was really special watching the hundreds of kids dressed in Disney gear descending upon the area. They were all so cute and excited! How fun! I would love to see Disney on ice! I’m glad you and your family had fun!